An insulated lunch bag with zippered top! This project is part scaled-down Basic Tote Bag (pg. 36) and part Zippered Cross-Body Bag (pg. 80). I used laminated cotton for the interior so it’s water resistant and easy to clean — must-have features for a lunch bag, in my opinion. The bag is interfaced with an insulated fleece (Insul-bright), which will help the contents stay at a consistent temperature for a little while. I’d been hoarding the cute food truck fabric from Timeless Treasures for a while and thought this would be a great use for it. Happy Hack-mas! It’s Dec. 1 and I’m full of holiday happiness — and sewing. This year has just flown by and one of the high points for me was the release of my third book, Hack that Tote!, in September. When I was in the planning stages for the book, I talked with my publisher about including a gallery of additional projects as inspiration. In the end, it didn’t make the cut. But as a gift to you, I’m sharing a hack a day with “recipes” for using the book to create the projects. Some hacks are super easy; others combine elements from multiple patterns in the book. Hopefully, they’ll inspire you to hack a few totes for your holiday gifts! A Tubular Frame Purse (pg. 60), made with a mix of quilting cotton and yellow vinyl. If you follow me on Instagram, you may already have seen this project. It’s definitely one of my favorites! I followed the pattern from the book fairly closely. The biggest change is the contrasting vinyl, which meant dividing the exterior panels into two pieces and adding seam allowance to join the two. Definitely use a leather needle for stitching the vinyl, especially the seam for those corded handles — it’s super bulky. Today is STEM Day here in Georgia, a day for schools and companies to increase awareness of career paths in science, technology, engineering and math. Miss L’s school observed STEM Day a day earlier and invited parents with STEM careers to talk to their child’s class about what they do. My job isn’t typically considered STEM but if you are still looking for speakers, I’m happy to come share about my work and how sewing and creating sewing patterns (and books) is as much about math and geometry as it is about fabric. This year’s Met Costume Gala theme is “Manus x Machina: Fashion in an Age of Technology,” which is related to my current explorations involving LEDs, el wire and the use of tech as clothing embellishments. This sounds great and interesting for the kids! … Thanks!! So my Power Point presentation, my bag of stuff and I headed out to talk about the STEM side of sewing and quilting for an hour before work. Crazy, right? I mean, who thinks of sewing and quilting as STEM? But that “M” — that’s “math,” and it’s everywhere in this passion of ours. I explained to the kids about creating pattern blocks/slopers from measurements, translating a 3D figure into 2D representation. How those slopers are used to create patterns, which are then cut out of fabric and sewn into garments.I showed them how arduino, conductive thread and LEDs add a little something extra to a quilted panel. After quizzing them about the Fibonacci sequence, I showed them a quilt that illustrates it perfectly (you can see it in action on my Instagram). They passed around English paper piecing samples and saw examples of arranging hexagons in different ways created new patterns. And then I gave them packets of paper hexies and glue sticks and cut them loose. I have no answer for that but I’m trying to start the conversation. I had no intention of doing handwork. Heck, I had no intention of ever quilting but you can see where that’s led. I took a class, with the delightful Jen Kingwell, and did my first hand-sewn quilt block (or at least part of a block). I’ve begun collecting things. Books. Patterns. Tools. “La Paz,” as many fans of the cover quilt refer to it, is what started my descent into English Paper Piecing madness. I’ve seen so many beautiful rosettes on social media and fell in love. Doesn’t matter that I’d never paper pieced before. It’s around 2,600 pieces, some of them about the size of a dime. Go big or go home, right? I’m endlessly amazed at how this book can make one shape — a hexagon — look so incredibly different. We’re doing the Glorious Hexagons variation as a block-of-the-month club at the shop this year and it’s taking all I have to not join. I’m so glad I added this book to my personal library. It’s not a project book, which might dissuade some folks from buying it. But the techniques and foundations of EPP within its pages are just what I needed. It’s a great resource and I find myself referring to it again and again. One of the things I’m loving about EPP is its portability. I can baste pieces any time I have a few minutes to just sit. So much better than staring at my phone! The Sew It Goes Tote is perfect for taking projects on the road. Kristin designed something that’s as functional as it is beautiful. Pretty sure I’ll be making a few of these as gifts for Christmas this year! I’ve surprised myself with the enjoyment of it. I’m certainly not going to forego machine sewing but the handwork is nice for those times when I can’t or don’t want to be in front of my sewing machine. Last year, I chose a word for the year: evolve. I used it throughout the year to remind myself to be more, try new things, stretch myself. In many ways, I think I did. I took part in a handful of online mini quilt swaps, took some classes and learned new skills (free motion and hand quilting, English paper piecing and hand piecing). I used tools I have in new ways. And I initiated a couple of business related things that may turn out to be really awesome things in 2016 and beyond. I have spent some time reflecting on 2015 and evaluating what I need to do to go even further in the new year and the years to come. What do I want? How do I make it happen? And one single word kept sneaking into the picture. Like many others, I struggle with ” imposter syndrome.” I question my skills, my talent, my ideas. I spend an inordinate amount of time talking myself out of following through because I doubt myself. In 2016, I believe that I can do what I dream. I believe that I can contribute and make a difference. I believe that my work and my ideas are worth sharing. I believe that happiness is contagious. I believe that I can inspire and encourage others to accomplish their goals. It’s happening this year. Believe me. I don’t know that I’ll ever stop hacking patterns, especially my own. I get bored making the same thing over and over again, so tweaking things here and there just helps keep things fresh. When I was working on Modern Style for Girls, I kept thinking of new ways to hack the patterns in the book. At times, I had to force myself to stay focused because an idea was so appealing that I wanted to get started right away! One of my ideas was this sweet party dress. I actually made and photographed this one as an extra style shot for the book but it didn’t get used. There’s only so much room! But that just gives me the chance to share it with you and give a little more information about how you can use Modern Style for Girls to make one for the girl in your life! This dress uses the same Basic Bodice but the full length instead of one of the alternate cutting lines. There’s still an invisible zipper in the back, so no change there. I paired it with the short sleeves and the collar from the Collared A-line Dress (make sure you use the correct neckline). I actually flat lined the collar with a piece of ivory lace I had in my stash. If you do this, make sure you pay close attention to where you apply the lace. I find it easier to lay out the collar as it would be on the dress so that I don’t accidentally flat line the same side of the collar pieces. For the skirt, I used a beautiful sheer cream fabric with a rolled hem and a cream lining fabric for a nice double-layered look. Because the invisible zipper ends above the waist, I could cut the same size pieces for both the front and back of the skirt (you can use the back skirt measurement from the Wrap Top/Dress as a starting point). Since these fabrics are so lightweight and gather easily, I cut them a little wider than I would have if I used quilting cotton or something a little heavier. The lining is a hair shorter than the exterior skirt but you could make them the same length, if you prefer. Voila! A picture-perfect party dress! P.S. 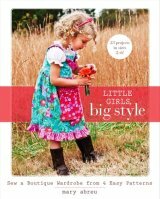 There’s still time to get an autographed copy of Modern Style for Girls before Christmas! My love for Lizzy House knows no bounds. In addition to being an amazingly talented artist, she’s also just an incredible human being. Smart, kind, warm. The kind of person to whom you’re just instinctively drawn. Seeing her at Quilt Market in Minneapolis this past May was a complete surprise and filled me with such joy. It was wonderful to hug on her and catch up — including chats about her newest fabric. Lizzy and I have chatted about knit fabrics in the past and her desire to find just the right fabric substrate for her designs. I have been stalking following along on her Instagram as she has worked with sample yardage, sewing it up into some of the cutest, most comfortable dresses imaginable. The line is called “The Hit Parade,” and features 12 prints on 95 percent cotton/5 percent spandex jersey. The fabric is 58″/60″ wide and has just the right amount of stretch for all kinds of knit garments: dresses, tops, skirts, leggings. I was only able to get 7/8 of a yard of these stinkin’ cute kitties and it took me a little while to figure out the perfect project — with Miss L’s input, of course. She really wanted a skater-style tank dress but I didn’t have enough fabric to comply, so I instead drafted a simple tank dress. I went a little big — not enough fabric for sleeves, so I wanted something she could still wear in the spring — and skipped hemming it to allow for a little more freedom once the weather changes. The arm and neck are finished with narrow bands of the same fabric, although fold-over elastic would have been a nice touch. I used my serger to make this dress but just as easily could have sewn it on a sewing machine. It’s only two pieces plus the three bands for finishing the arms and neckline, so it probably only took me about 30 minutes to cut and sew it. She layered it over her tee shirt and added her favorite boots and I can totally see adding leggings or tights as the temps drop. It’ll be perfect in the spring with sandals. As will the other dresses she’s already asking me to make with the other prints she loves. I am beyond excited to be a guest on the Aug. 10 episode of the American Patchwork & Quilting Podcast with the delightful and oh-so-talented Pat Sloan! Tune in and listen as we chat about my books, sewing and a bit of my costumed hi jinks. You can listen to the show live, starting at 4 p.m. Eastern time.